When David is not making music, he is equally passionate about his other life, as a Geek. He is the founder Reimagine AI, an artificial intelligence creative studio working with companies like Google Brain and focused on building interactive artificial intelligence technology. David is an in-demand keynote speaker and travels the world speaking about the creativity, innovation and artificial intelligence to companies like Google, 3M, Cisco, Pepsi and Deloitte. He is also the co-creator (with Dr. Damon Matthews) of the Climate Clock. The Climate Clock has been presented at the UN's Cop23, the G7 Summit and is presently on exhibit with the Canada Museum of Science and Innovation. David has a degree in political science from Simon Fraser University and his book on creativity and the creative process, Let the Elephants Run • Unlock Your Creativity and Change Everything is out now. • The Climate Clock was presented at the G7 Summit in Quebec City. 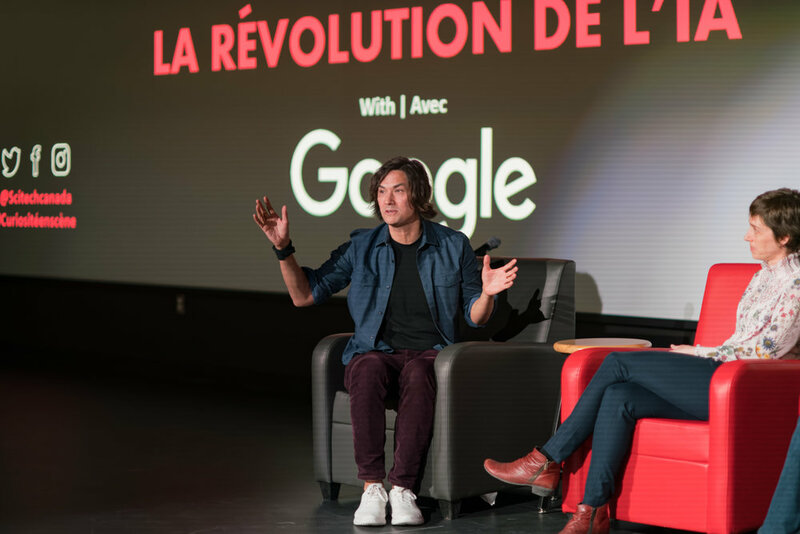 • David spoke at Google Toronto on Artificial Intelligence and Creativity, May 2018. • The Climate Clock is on tour with the Canada Museum of Science and Technology traveling exhibit about climate change for the next 3 years.